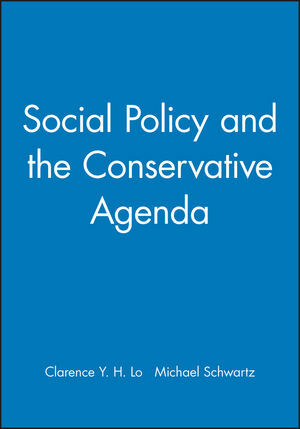 A comprehensive collection of original essays by leading experts on social and econmic policy including Frances Fox Piven, Harvey Molotch, Jill Quadagno, James Petras, and Judith Stacey. This volume challenges the conservative notion that the fundamental problem plaguing America is dependancy on government and further cuts only lead to a cycle of recision. Clarence Y. H. Lo is Associate Professor of Sociology at the University of Missouri at Columbia. He is the author of Small Property versus Big Government: Social Origins of the Property Tax Revolt (University of California Press, 1990, revised edition 1995) and writes articles about theories of the state and conservative social movements. Michael Schwartz is Professor of Sociology at the State University of New York at Stony Brook. He is the author of The Power Structure of American Business (Mizurchi and Schwartz, CUP, 1987), and The Social Construction of Industry (McGuire, Granovetter and Schwartz, CUP, 1996). He writes extensively in the areas of economic and political sociology, and social stratification. Why the Clinton Administration Did Not Alter The Conservative Trajectory in Federal Policy: Michael Schwartz (SUNY-Stony Brook). Part I: Welfare, Social Security, and the State of Austerity:. 1. Welfare and the Transformation of American Politics: Frances Fox Piven (CUNY-Graduate Center). 2. The Democratic Party and the Politics of Welfare Reform: Ron Walters (University of Maryland). 3. Urban America: Crushed in the Growth Machine: Harvey Molotch (University of California, Santa Barbara). 4. Rhetoric, Recision, and Reaction: The Development of Homelessness Policy: Cynthia Bogard (Hofstra), and J. Jeff McConnell (SUNY-Stony Brook). 5. Social Security Policy and the Entitlement Debate: The New American Exceptionalism: Jill Quadagno (Florida State University). Part II: Welfare-Warfare Spending, Technology, and the Global Economy:. 6. Wealth and Poverty in the National Economy: The Domestic Foundations of Clinton's Global Policy: Morris Morley (Macquarie University) and James Petras (SUNY - Binghampton). 7. America's Military Industrial Make-Over: Ann Markusen (Council on Foreign Relations). 8. Big Missions and Big Business: Military and Corporate Dominance of Federal Science Policy: Gregory Hooks (Washington State) and Gregory McLauchlan (University of Oregon). 9. Active-competitive Industrial Policy: From Elite Project to Logics of Action: J. Kenneth Benson and Nick Paretsky (University of Missouri). 10. Where Are All the Democrats?The Limits of Economic Policy Reform: Patrick Akard (Skidmore College). 11. Failure of Health-Care Reform: The Role of Big Business in Policy Formation: Beth Mintz (University of Vermont). Part III: Acting Out Conservative Ideology:. 12. The Malignant Masses on CNN: Media Use of Public Opinion Polls to Fabricate the "Conservative Majority" against Health-Care Reform: Clarence Y. H. Lo (University of Missouri). 13. Popular Consensus or Political Extortion?Making Soldiers the Means and Ends of U. S. Military Deployments: Jerry Lee Lembcke (Holy Cross College). 14. Theorizing and Politicizing Choice in the 1996 election: Zillah Eisenstein (Ithica College). 15. The Right Family Values: Judith Stacey (University of Southern California). 16. Contradictions in the Conservative Agenda: Welfare Reform and Reproductive Politics on a Collision Course: Carole Joffe (University of California - Davis). Business Action, Conservative Acting, and Institutional Enactment: Economic Constraints on Social Policy: Clarence Y. H. Lo (University of Missouri).